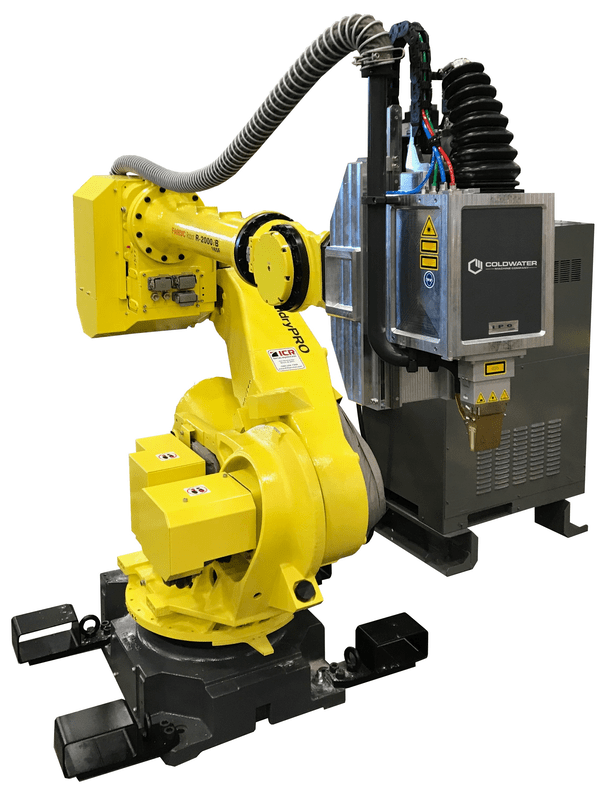 Coldwater Machine has announced its ability to design, build and integrate Laser Seam Stepping automated work cells, most recently integrating two IPG Photonic laser seam steppers with FANUC R-2000i/165 robots along with part fixtures and part magazine systems to join stainless steel components for an appliance manufacturer. These systems are also very well suited to automotive body-in-white applications and anywhere there is a need for low heat input and good surface finish. Laser Seam Stepping is essentially a laser-based stitch welder that uses special optics to position the laser spot for joining the components. The systems feature integrated clamping technology, and the laser welding takes place inside the pieces being clamped together, providing a Class 1 safety enclosure. Depending on the application, it is an excellent replacement for resistance spot welding and offers the benefits of fast welding speed, repeatability, high productivity and low heat input. And, given the fact there is no need for complex laser-protected housings, these work cells can easily be used on production lines. Coldwater Machine Company has extensive experience integrating laser technology (fiber, CO2, solid state) into its engineered systems to deliver advanced manufacturing solutions. Coldwater develops both custom and standard laser systems for high precision welding, marking, ablation, cutting, hardening and peening.